“The Lost Fleet” has all the makings of a typical sequel – exotic locales, more shipwrecks, and even a new villain. 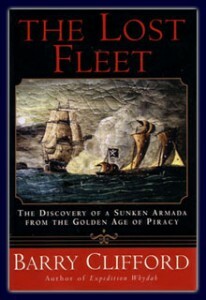 Where Barry Clifford’s account of his discovery of the Whydah occurred domestically in the relatively uneventful waters off Cape Cod, his exploration of an entire sunken armada near Venezuela brings us the dangers of foreign governments in turmoil, ravenous barracudas, and a power-hungry dentist turned jungle explorer. It would almost seem ridiculously stereotypical if it wasn’t all true. In his earlier book, “The Pirate Prince,” Barry Clifford introduced readers to the less romantic aspects of treasure hunting – permits and salvage rights are rarely discussed in adventure novels. His new experiences filming the wreckage at Las Aves has many similar, although somewhat amped up, challenges, but not necessarily enough to make this second novel a thrilling read on its own. Fortunately Barry seems to have been aware of this, and so he parallels his own explorations with a detailed account of the lives of some of history’s more noteworthy buccaneers. Men like Laurens de Grafs, the Chevalier de Grammont, and Nikolaas Van Hoorn. According to this telling, it’s quite possible that the entire Golden Age of Piracy was born of, or at least kicked off by, the events that transpired at Las Aves in 1678 as a combined fleet of French navy and buccaneer mercenaries found themselves shipwrecked on a narrow spit of land. This devastating blow seriously weakened the French influence in the caribbean, but it also brought a number of buccaneers together, and got them to consider what things might be like if they were to join forces and focus their efforts a bit less on pig hunting, and a bit more on coastal raids (particularly on the towns of the hated Spaniards.) They started with Maracaibo, moved on to Caracas – and pirate history was born. I find many “general history of piracy” books to be rather trying – too many names and events easily get muddled about in my head. But in “The Lost Fleet,” Barry makes a point of not only telling us who these early buccaneers were, but how their lives interacted with each other as piracy in the Caribbean grew from a few former hunters looking for revenge on the Spanish to privateering on behalf of nations, and eventually onto an undeclared war on all civilization. It’s a fantastically interesting and informative look at some of piracy’s most influential but all-too-often neglected figures. Barry’s account of his own crew’s exploration of the Las Aves’ wreckage is also interesting, but not quite as fulfilling. His mission was basically to film everything yet disturb nothing, which, while admirable, leaves things feeling a little incomplete. With no gold discovered or cannons salvaged it’s hard to feel much was accomplished. It also doesn’t help that Barry’s arch-nemesis on the trip, Charles Brewer, represents a threat that never truly materializes. But as this is an autobiography and not a work of fiction, I suppose we can’t hold it against Barry if Charles never ambushes him in a wonderfully dramatic final confrontation. All told, this was a very interesting and educational read. The history of the buccaneers in particular shouldn’t be missed, but the story of the wreckage filming is also quite worthwhile. Definitely recommended. This entry was posted in Books and tagged clifford, history, non-fiction by Bilgemunky. Bookmark the permalink.